In stock -This product will ship today if ordered within the next 8 hours and 56 minutes. 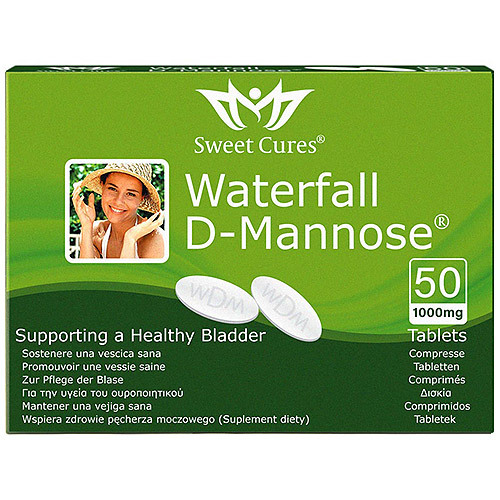 Sweet Cures Waterfall D-Mannose is a simple monosaccharide that offers safe and consistent results, and supports a healthy bladder. D-Mannose supports a healthy bladder, prostate and urinary tract. By adhering like velcro to bacteria, it flushes bad bacteria out safely and naturally. The convenient 1000mg tablets are formed through pressure, resulting in no unwanted products, binders or fillers. Pure Bio-Active D-Mannose, veg mag stearate, hpmc film coating. For urgent bladder support, take 2 or 3 tablets every 2-3 hours. For maintenance, take 2-3 tablets before bed. Take with a drink (not cranberry or orange). Keep out of reach of children - Choking hazard. Diabetics should monitor blood-sugar levels. Always consult a doctor before changing any medical regime. Below are reviews of Sweet Cures Waterfall D-Mannose - 50 x 1000mg Tablets by bodykind customers. If you have tried this product we'd love to hear what you think so please leave a review. It is a brilliant product I cannot live without due to my re-occuring bladder problems. I do think this is an excellent product. I have had water infections now for the past year or so. I was horrified about having an infection but it is quite common. Now that said I went onto antibiotics which took 2 types to work and much embarrassment. Weeks later it was back so I did some reading and found out quite a lot about things. This product is great for immediate relief and can let you go about your daily life without wondering where the next toilets are. It is also easy to use, I did not use it through the night as advised, I like my sleep, just during the day. They are quite large tablets but I found no difficulty. I have used maybe 3 packs (2 packs in a box) so far and only for a week at a time initially then for 3 days the last time. I have been free now for over 6 months and not been back to the doctor. If you have tried the rest then do try these they worked for me and it makes sense. I did not want to be on the antibiotic merry-go-round, it is not a fun ride! I do try and drink more water and eat dried cranberries sweetened with pineapple juice and no sulphur dioxide now. It is quite expensive but believe me the relief you get is worth it! I hope this helps someone somewhere that feels like they are stuck in a cycle of misery and discomfort. Read up about the product and buy some they work. This is an update to my last review. I have had cystitis now for just over a month, (it just keeps coming back). In the end I had to take a three day day course of antibiotics and it didn't work, so now back on the D-Mannose tablets and after two days it has started to ease, would not be without these now. 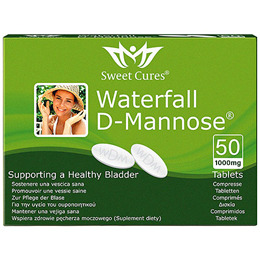 Sweet Cures Waterfall D-Mannose tablets were recommended to me and they are excellent, keeping a recurrent bladder infection at bay. It's so good to go to bed and not spend half the night, up and down to the bathroom. I have found, d-mannose suits me better, taken during the day, rather than at night. The best i have had. Hi, this product I believe is better than antibiotics from the doctor. I recently had a bladder infection so I went to my GP and was prescribed antibiotics which did certainly ease my symptoms but did not take the infection away. A friend told me about this product so I tried it and it cleared up the infection within days. This product is wonderful and if ever I feel the infection is returning (I am prone to it which in my case leads to other problems due to a prosthetic knee) I simply take these tablets for a few days and I am healthy again, I wouldn't be without it. I was very happy to be recommended by the specialist to try Waterfall D-Mannose tablets as an alternative to antibiotics. I have been suffering from recurrent urinary tract infections for several years and my infection is now described as "chronic". I've been using D-Mannose for a couple of months and though the infection has not completely disappeared, the painful symptoms are very much reduced... to the extent that I can now say "Bladder... What Bladder?!" I have had cystitis since I was 18 now (69) I had to take antibiotics on and off over several years for the complaint, but it kept coming back. Then was unfortunate to get an overactive bladder, joined the (Your bladder health) organisation and thankfully they recommended D-Mannose. Now take the full recommended dose when I get a flare up and the two at night for maintenance. I take D-Mannose for an enlarged prostate and they work well for me, keeping infections at bay. Would not be without them. Really good stops me from getting urine infections take maintenance dose all the time. Since taking d-mannose I have had no recurrence of Urinary Tract infection, so will continue a maintenance dose. Excellent product. I have had severe water infections that have required long term antibiotics (10+years) but contracted another UTI despite taking Trimethoprim. I was treated with three courses of Nitrofurantoin before it finally cleared. I knew cranberry had a good reputation as a natural preventative but was unhappy taking a sugary juice every day. I learned that it was the D-Mannose in cranberry that helped prevent cystitis and UTI so I began taking this supplement. I take one tablet three times a day to allow the product to stay in my system. I have had no problems with my urinary system and it's great to be off the antibiotics after all these years.